Amos Gitai. Youssef Chahine. Danis Tanovic. Alejandro Inarritu. Samira Makhmalbaf. Shohei Imamura. Sean Penn. Mira Nair. Ken Loach. Idrissa Ouedraogo. Claude Lelouch. Drama. Art House. Politics. Recommended. 01 Mel's Must Sees. Disaster. True Stories. A homage to the memory of events that took place on September 11, 2001 in New York. Eleven Directors from around the world put together a series of shorts each one 11 minutes, nine seconds and one frame in length and all based around the consequences of that fateful day. 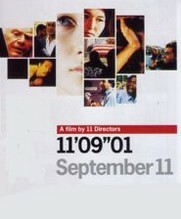 11'09"01 is a thought provoking and often moving experience that covers many cultures and provides a refreshingly honest and diverse breadth of opinions.